This page contains a number of articles to enable you to research soldiers who served during the First World War. If you are just starting out, I would recommend reading my guide to First World War Medals first, before moving on to my articles on finding First World War service records, using regimental histories, and local newspapers. 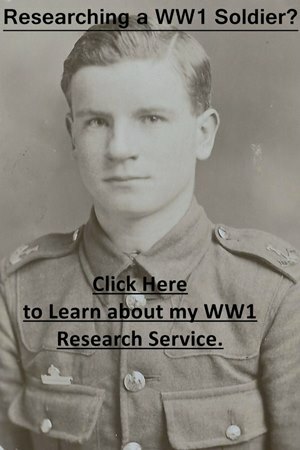 As well as creating the guides, I also offer a First Word War Soldier Research Service. Using WW1 Medal Index Cards and Medal Rolls These two sets of documents are the best starting point into researching a World War One soldiers. WW1 Medals: A Guide to campaign medals awarded to British soldiers for service during the First World War. British Soldiers’ WW1 Service Records: A Guide to finding and viewing a soldier’s service record. British Officers’ WW1 Service Records: A Guide to finding and viewing an officers’ service record. British Army Abbreviations and Acronyms: A list of the most common abbreviations and acronyms found in WW1 Records. How to Interpret WW1 Photographs: Learn how a single photograph can help you unravel the service history of a soldier. Using WW1 War Diaries: How to find the correct war diary, what it is likely to contain and how to use it to further your research. Using the London Gazette: A key newspaper for researching First World War officers and soldiers who were awarded gallantry medals or honours. International Red Cross Prisoner of War Records: An excellent online resource available to view for free if you are looking for a prisoner of war or a soldier who was missing in action and later confirmed killed. If you’re researching a First World War soldier then you’ll need to look at the records on FindmyPast which offers a free trial period. Clicking on the banner below will take you to the website. British Cavalry Regiments: Articles on British cavalry regiments which served in the First World War. British Yeomanry Regiments: Articles on British yeomanry regiments which served in the First World War. Foot Guards: Articles on the Grenadier, Coldstream, Scots, Irish and Welsh Guards to help you research those who served with the Regiments. British Infantry Regiments: Guides to British Infantry regiments which will help you research those who served with them. Soldiers Died in the Great War 1914-1919: An important resource if you’re researching soldiers who died while serving with the British Army. The Bond of Sacrifice: Useful if you’re researching an officer who died between August 1914 and June 1915. De Ruvigny’s Roll of Honour: An important source which contains 25,000 biographies of casualties with over 7,000 portraits. WW1 Casualty Lists: These lists may be the only surviving evidence that your relative was wounded in the war. Using Local Newspaper Reports in your Research: A case study looking at the death of Maxwell Frank. Using WW1 Regimental Histories: How regimental histories can help you with your research. Hart’s Army List: How to find and use these useful books when conducting research into an officer. Absent Voters Lists: An underused resource which may hold the key to researching a soldier who served in a Corps of the British Army. The National Roll of the Great War: An important source of information for 100,000 members of the armed forces and those who undertook war work. Most of the entries are for those who survived the war. Structure of the British Army in World War One: Learn the difference between a Battalion and a Brigade in my helpful guide. Structure of a British Infantry Battalion: A guide to how a British infantry battalion was structured. Structure of a Cavalry Regiment: A guide to how a British cavalry regiment was structured. Why a Soldier is not with a Local Regiment: An article explaining why a man from Dorset could end up in a Highland Regiment. The WW1 Memorial Plaque: How the plaque was created and an explanation of its many symbols. The Silver War Badge: A guide explaining what a Silver War Badge is, where to find the records, and what information they contain. The Territorial Force Imperial Service Badge: Learn about this short-lived badge with identifies the wearer as a Territorial. Overseas Service Chevrons: Have a look at a soldier’s right sleeve, does he have small chevrons showing? WW1 Wound Stripes: Have a look at a soldier’s left sleeve to see if they are wearing a wound stripe. Gallipoli Campaign: Learn about the Gallipoli Campaign, the Commonwealth War Graves Commission cemeteries and how to visit the battlefields. Malta: Learn about the cemeteries found on Malta which contain the graves of Commonwealth soldiers who lost their lives in the First World War. Below are the medals issued to my great-great-grandfather Albert Bryant who served with the Army Veterinary Corps during the First World War. 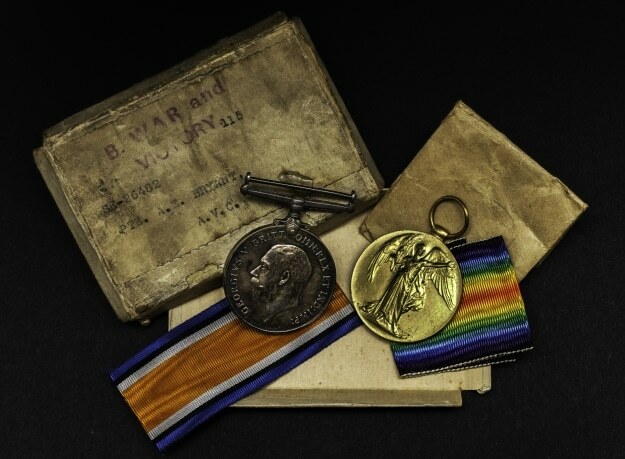 Both the box and the medals contained all the information I needed to start my research into his WW1 service. The medals are impressed with Albert’s service number, rank and unit: SE-26482. Private. Albert Bryant. Army Veterinary Corps.